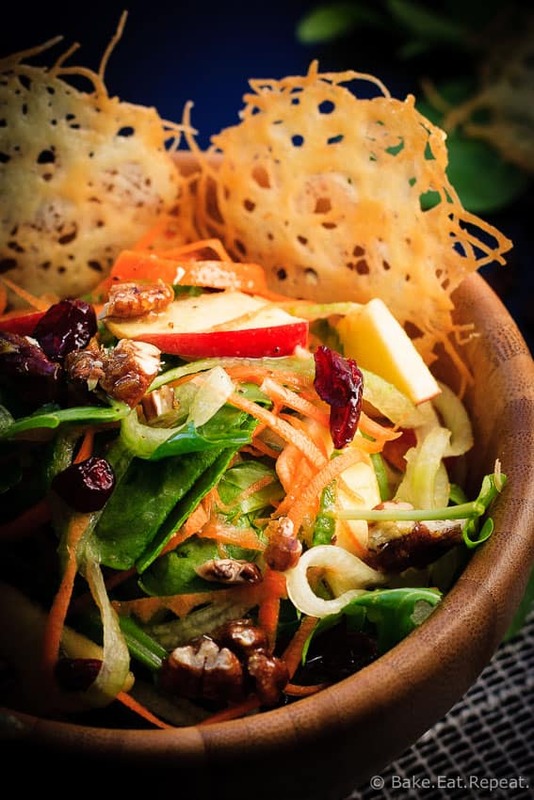 Amazing carrot, apple and cucumber salad with candied pecans and asiago crisps, all drizzled with a red wine vinaigrette. With candied pecans and asiago crisps! Which I really wanted to put in the title, but decided it was just getting entirely out of control. A two line title is definitely too long for a recipe. This salad was just fantastic. Of course, I love salads and am happy pretty much anytime a salad is involved. But even my husband commented on how amazing this salad was, and he’s not a real fan in general. He’ll eat them, but it’s not really the point of the meal, it’s just filler in his opinion. This carrot, apple and cucumber salad with sweet and spicy candied pecans and asiago crisps will definitely be made many more times. Even the kids loved it. They didn’t have any dressing on theirs (and they completely missed out I might add because the red wine vinaigrette is fantastic), but they loved all the components and were rather disappointed that there weren’t any leftovers for the next day. This salad is full of delicious things. 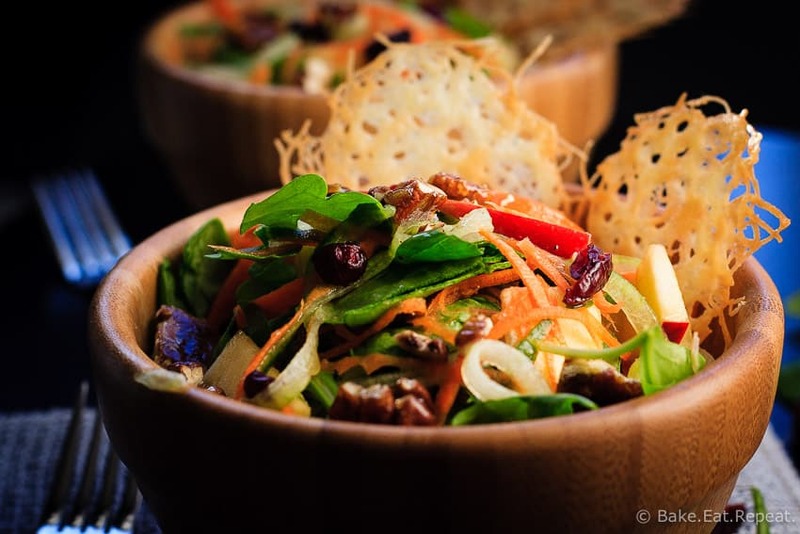 Spiralized carrots and cucumber, thinly sliced apples, baby spinach, dried cranberries, candied pecans that are sweet and crunchy with a hint of spice, and crispy asiago cheese, all drizzled with a red wine vinaigrette. Fantastic I tell you. Yes, there are a lot of components, and yes, it takes a couple minutes to prepare. But none of the steps are difficult at all, and the dressing and pecans can be made a day or two ahead of time to make things faster. I think this could even be made into an amazing main dish salad if you added some cooked chicken for protein. In fact, I’m definitely doing that next time! We loved everything about this carrot, apple and cucumber salad. With candied pecans and asiago crisps. Yeah, it’s all important – should’ve just thrown everything in the title after all! Prepare the dressing. Whisk together (or shake if you have a jar) the red wine vinegar, olive oil, garlic, dijon, sugar, salt and pepper. Refrigerate until ready to use. Spread the pecans on a baking sheet and toast in the oven for 8-10 minutes until fragrant. Keep an eye on them so they don’t burn. Take them out of the oven and increase the temperature to 425 degrees F.
In a small skillet over medium low heat, place the sugar, cayenne and salt for the nuts. Stirring constantly with a rubber spatula, heat the sugar until it liquifies completely. It will clump together and then slowly melt into a liquid. Stir in the toasted pecans to coat them in the liquified sugar and spread them on a piece of parchment paper or a silicone mat to cool. They will stick together as the sugar hardens quickly, just spread them as best you can. On a baking sheet covered with parchment paper or a silicone mat, place the grated asiago cheese. Make 8-10 two inch wide circles with the grated cheese. Bake in the 425 degree oven for 9-10 minutes until the cheese is lightly browned and bubbling. Keep an eye on it as it goes from perfect to burnt very quickly. Remove from the oven and allow to cool on the baking sheet. Prepare the salad. 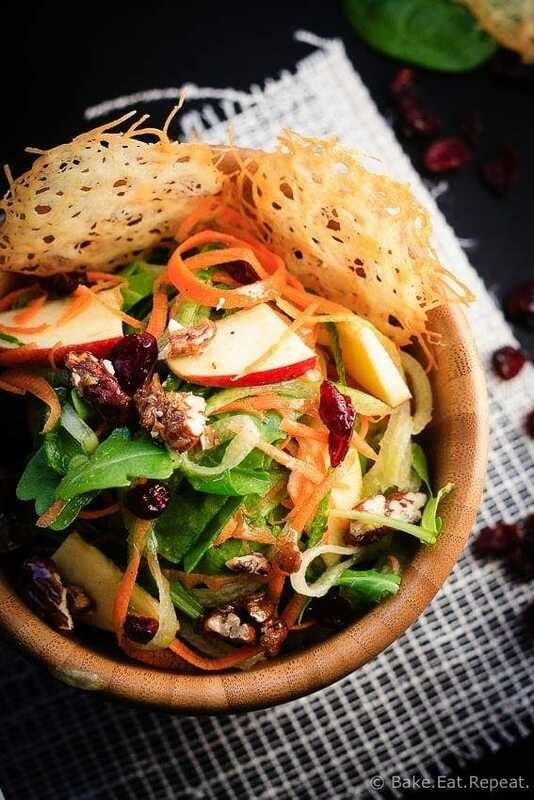 In a large bowl, toss together the carrots, cucumber, apples, spinach and cranberries. Chop the cooled candied nuts coarsely. At this point you can toss them in the salad along with the dressing and serve. Or keep the components separate and make individual bowls of salad so everyone can add their own dressing. (This is what we do as everyone here likes their salad a bit different - and then any leftovers can be kept for the next day without going soggy.) Serve with one or two asiago crisps on top. Enjoy! This is a long recipe - but all the steps are very easy so don’t be alarmed! For the candied pecans - I’ve made then without toasting them first and they were still amazing, so you can skip that step if you’re pressed for time. We didn’t use all of the dressing, so you may have some leftover depending on how much you like on your salad, but it keeps well in the fridge for up to a week and it’s amazing so I’m sure you can find some use for it! You can also make the candied pecans and dressing a day or two ahead to save some time. Source: This is a combination of recipes - from here , and here , and a few other things thrown in as well! Disclaimer: I received a Microplane spiralizer tool that I used for this recipe, and have entered it in this contest. This salad looks SO tasty! We've been eating lots of soups lately, since my hubby's recent heart operation, and now that he's able to add more variety to his meals, I can't wait to try this new recipe. mmmm mmmm! Oh my, those crisps!! How fun! And this whole salad! So my kind of dish - it sounds just fantastic!! I love salad! I could eat it for every meal. I'm a huge fan of fresh raw veggies. This salad sounds so good with apples and cranberries. I wish I was having this for lunch today! Me too! Salad is the best and I could totally have it every day. Although it would probably have to always be different! :) Thanks Jen! I'm also in the camp that salad is just filler, and it doesn't usually excite me, but THIS salad definitely does! You had me with the cranberries and pecans! And there's so much other deliciousness in this too! The cranberries and pecans are definitely one of the best parts! Thanks Sarah!